Singer-songwriter Billy Joel was slightly injured and mostly embarrassed when he lost control of his vintage car on a rain-slicked road and banged into a house, the Grammy Award-winning artist's third car accident in two years. There was no evidence of alcohol or drug involvement and Joel was not suspected of any crime, said Nassau County police Officer Joan Eames, a police spokeswoman. 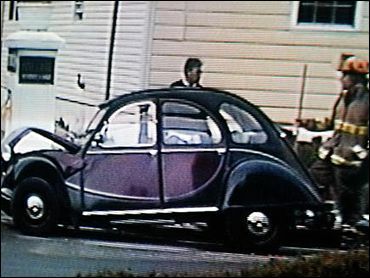 Witnesses said the accident occurred at about 4 p.m. Sunday, when Joel, driving a burgundy and black 1967 Citroen, crashed through a row of bushes and banged into a small beige home one block from the beach. "He seemed embarrassed that he lost control of the car," said witness Thomas Phillips Jr. "He said, 'I can't believe I got in another accident.' He was just going out to get a pizza." The accident left a crack in the house's foundation and 6-foot-long skid marks in the sand in the street, witnesses said. Joel suffered a small cut on his left ring finger but refused medical attention, Eames said. No one was in the car with the 54-year-old Joel, and no one in the house was injured, police said. Neighbors said there is a broad bend in the road there, and a motorcycle crashed into the same house last year. Last year Joel was hospitalized after smashing his car into a tree along a highway on far eastern Long Island. No summonses were issued, and Joel was not given a Breathalyzer test. Joel, a member of the Rock and Roll Hall of Fame, escaped serious injury in a crash in East Hampton in June 2002. He later checked into a New Canaan, Conn., substance abuse and psychiatric center. Joel was involved in a motorcycle accident on Long Island in 1983. He and model Christie Brinkley, who divorced in 1994, have a teenage daughter, Alexa Ray. Following last year's car accident, Brinkley expressed concerns about their daughter riding in a car with him. Earlier this month, Joel went to an emergency room after cutting his finger opening a can of beans, and in September, he broke his wrist at his new Center Island mansion. Joel has had more than two dozen Top 10 hits in his career, including his signature 1974 song "Piano Man." His music, including the title song "Movin' Out," is currently the subject of a Broadway musical. Still, the 94-year-old homeowner, Maria Dono, told the New York Daily News she had no idea who Joel was.